Simple Crafts - A craft for everything & everything in a craft. I’m increasingly in love with fun foam sheets for a bit of quick crafting; I’ve seen some amazing stuff done with it (I do NOT do amazing stuff!) over on Pinterest, but what I do love is that is is very versatile. It works brilliantly for something rough and ready and which needs to be weather proof and then there are terrible clever people who do remarkable things like some of the crafts I’ve piunned on my Kid Craft pin board below. I rattled this up as part of my Bostik Blogger challenge because I wanted to see how their Blu Stick works on foam sheets; it’s an ordinary glue stick which is blue on application and turns clear as it dries. It doesn’t stipulate that it can dry clear on foam, but I’m pleased to say it does. The beads are a Craft Planet mix of wooden beads, sewn on with acrylic yarn. 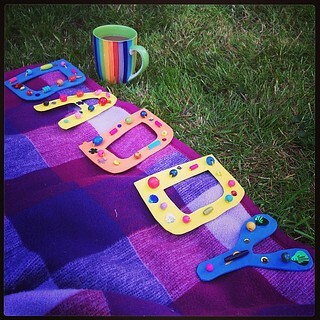 Follow Merrily Me’s board Kid Craft on Pinterest. Disclosure: I blog at Patch of Puddles where we are a Bostik Blogger and get products for free to produce crafts. We supply the craft kit to the bloggers from CraftMerrily, our online craft shop. Amazon link is an affiliate link. Over the years sewing with felt and comforting embroidery cottons has proved a hit with my girls again and again. This quick purse was made up from scraps of acrylic felt and oddments from a craft pack and was really easy to put together but a very pleasing finished product. A large button, scraps of ribbon & felt or foam scraps for leaves. Fold your strip of felt so the pocket end is roughly double the depth of the flap (2/5 front of pocket, 2/5 back of pocket, 1/5 flap). Pop a pin in the middle of the doubled over layer to hold it together. Using blanket stitch start at the bottom corner of your pocket and stitch the front and back side of the pocket together, keep blanket stitching around the flap as a decorative edge and then go back down the other doubled side of the pocket. Make sure you hide your knots inside the pocket to look neat. We decorated the front of the pocket with sticky foam flower stems and leaves but you could glue or stitch on felt versions just as easily Sew a button at the top of the stem; this will be the fastening and the centre of the decorative flower. Cut a button hold in the flap, making sure it lines up with the button underneath. You can blanket stitch or over-stitch around this as strengthening if you wish. Stick short lengths of ribbon around the button hole a petals. Make sure the inner ends of the ribbon will be covered by the button when it is through the hole. Once you’ve got the basic idea you can add loops on the back for attaching it to a belt, or a strap and make it in any size you like and with any design. As projects go for little people who enjoy making but need to use fairly simple skills and have a finished product quickly, it is ideal. If blanket stitch is too hard overstitch looks nearly as good and even a simple saddle stitch will work. A year ago my girls spent a happy afternoon making these banners to decorate the house for Easter – such is life with a small person in the house, I’ve only just got round to blogging them. 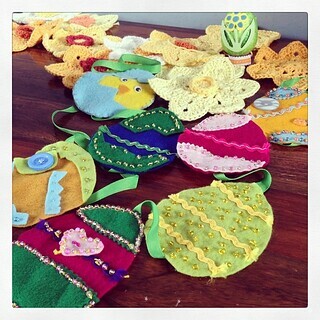 Once made, we glued them on to long lengths of ribbon and hung them on doors and curtain rails for Easter. While it is fair to say their technique might needs some work (ragged edges etc probably won’t make them a runaway Pinterest hit!) they learned loads about colour, design, embellishing, sewing, patience and neatness along the way. What to do with a Polystyrene egg? We recently used a crafting kit from our website that included lots of bits and bobs of different craft materials, not least 3 different sizes of polystyrene egg. I was hoping to get to decorate one myself but the girls used them all up before I got a chance! I rather liked the fact she secured his arms with packing tape but turned it into a jacket – I must buy some washi tape to explore that as an idea! He has ribbon for hair and a cake case for trousers and a very dapper bow too. For a much cheaper take on the old Faberge egg, a combination of Sharpie, self adhesive flowers, and ribbon around a small pot lid works pretty well. We gave this some added sparklet with glitter glue too. For more Easter Craft ideas, visit our Pinterest board. I’m not always very good at mixing my crafting media; I tend to make something out of all felt, or all Fimo etc But I happened to find myself playing with a Spring craft pack the other day that had been created in our shop for a set of bloggers and it pulled together a variety of different early years materials that I wouldn’t normally be playing with. The result was a very happy afternoon making some very gorgeous items with my girls which thoroughly pleased us 🙂 We made various cards from the items in the kit and Josie did a great job of making something really pretty out of an assortment of different materials. I’m going to give pride of place to my favourite one though which is nothing more complicated than layering a set of items together but really worked for me; it has sat on the shelf for a week or two now but I’m liking it so much it may end up staying! I’ve taken a liking to craft foam recently, having never really played with it before. These self adhesive shapes are great and I like the way you can swap them about to give a multicoloured look to the tulips. I stuck them on to felt and then used glue squares from last months Bostik challenge to to stick that to the felt rectangle I glued on to the card with a bit of a 3D effect. It’s all terribly simple and the materials are deceptively basic, but the effect is quite stunning. Josie made more cards too. Apparently I put the one on the left sideways. Easy peasy, lemon squeezy. Disclosure: on our other blog, we are part of the Bostik challenge and receive some free items from them which we used this month for these cards. The kits come from our own shop, CraftMerrily. If you read our other blog, the one about out family, you’ll know it is now nearly 4 years since our little boy fdied at 11 days old. He was an April baby and daffodils are the flower that we most associate with him. This year though, the mild winter means they are already flowering and will be gone before his birthday. I’ve asked some blogging friends to join us in making daffodil crafts to light up April with yellow anyway. 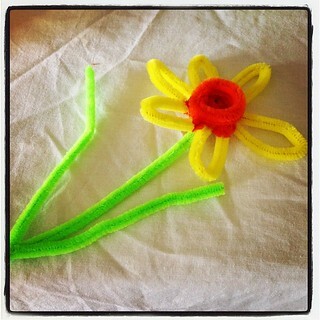 Today I had reason to play with chenille stems and made this little pretty. It couldn’t be simpler. Join two yellow stems by twisting the ends to make a long stem. Make a zigzag with 6 points, then join them into a circle with another twist. Use an orange stem to bind the centre together with crossovers (a bit like weaving a star into the middle of the flower) until it is solid and holds flat. Use another orange stem to coil a trumpet, then use the last inch to bind over so that it stays a tight coil. Work a half green stem into the back of the flower for a stalk and twist a second full stem to the bottom and bend up to make leaves. 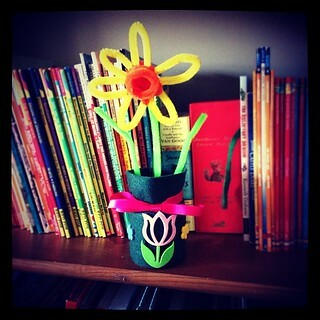 A glass jar, some plasticine, felt and stickers made a nice pot for it. 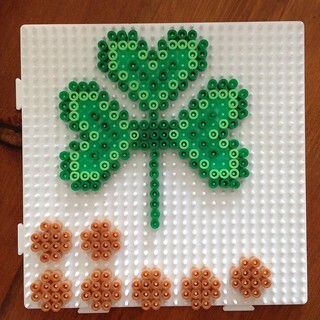 If you are gearing up for some St Patrick’s Day crafting, you might like these free hama bead patterns. Made with Green, Mint Green, Translucent Green and Pastel Green, they cheered up my day enormously. You can also strengthen them around the stalk with clear and make a mobile from them. I sorted the outline first to make it easier and followed inwards from there. On the bigger one, some of the inner rows have an extra bead in the corner to stop it being too square. A lovely easy but satisfying pattern to make. And some gold coins too… well, it would be rude not to! 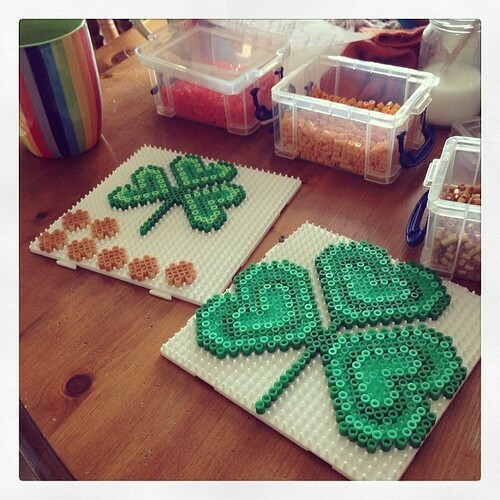 St Patrick’s Day seems the perfect time to bring out two of my favourite crafts again; Fimo and glass jar decorating! This is an easy craft which would be great as a sweetie jar (smarties arranged in rainbow layers perhaps?) or a candle jar or a place to collect you very own gold coins. It’s quick to do so here is how we did it. Blend up scrap green Fimo or Sculpey into a stripy, swirly or mottled look. Of course you can use plain, but we liked the depth and variety we got with a blend. Roll it out and cut out heart shapes using a small icing cutter., then press a texture plate into the surface of the heart if you wish. Our swirls added a little oumphf to the look of the thing. 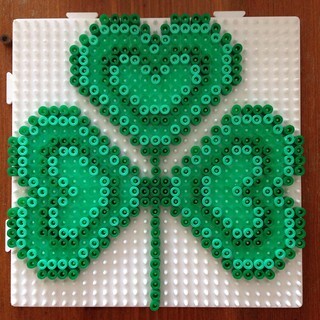 Arrange the hearts on the jar in groups of 4, making sure that the pieces touch the next 4 leaf clover along at some point. It’s really important clay forms a ring all around the jar so that when it bakes, it contracts and holds on. Add a blob of contrasting green to the middle and use a blunt tool to add texture. It’s not exactly botanically correct, but it just looks better! Twist up the remaining clay into a long sausage, double it and make a long thin twisted sausage. Wrap that around the rim of the jar to cover the threat. 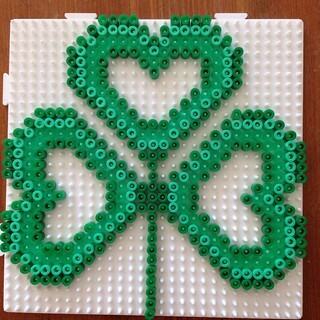 I made a little charnm sized shamrock to top it off and cover the joins. For more ideas, see our Pinterest board. Over the Summer, Maddy wanted to experiment with using our new sewing machine and decided to have another go at a bag she had tried once before and hadn’t been so pleased with. This time she put a little more thought into how to build up her pattern and layer the seams so it worked as she wanted and the result was really rather good. Here’s how it went… in fairly general terms! 1. Cut out two rectangles of fabric, the outer and the inner. In this case it was yellow spotty fabric and some calico inside. Put them right sides together and pin. 2. Stitch down each long side about 5mm from edge and turn through. 3. Fold the tops inwards so ragged edges are inside and pin flat. Ironing at this point is a good idea. 4. When you are happy the tops are level and the inside doesn’t show above the outside, stitch as neatly as possible, about 5mm from the edge. 5. Fold it in half so you have an accurate idea of the size of each panel. When Maddy did her version she actually attached the cat motif before the lining and sewing. On reflection this made it stressy and if you are neat, attaching the motif all the way through the inner and outer layer of fabric is probably no big deal. Who sees the inside anyway? It’s up to you but if you want it all contained inside the lining, you need to do this bit first and be careful you place it correctly, bearing in mind seam allowances). 6. Use the cat outline to cut out a version of the motif in fabric and also in felt. (Click on the picture, right click and view and you’ll get a full sized version). Top tip, cut a mm or so outside the line to make you fabric version and a mm or so inside for your felt version. 7. Put the felt version on top of one side of the bag on the outside. Put the fabric version on top. The felt adds body and makes it more like applique. Pin it carefully and then very slowly stitch the cat to the bag. Maddy did zigzag stitch and straight stitch for the paw outlines. You could just as easily hand sew it. Maddy used yellow to match the body of the bag. 9. Next you need some wide ribbon. Cut a piece long enough to cover the length of each side of the bag and made a shoulder strap. It has to be attached to the sides so it folds equally over the front and back edge. Start at the bottom of one side (turning the ribbon under if it will fray) and pin it up one side. Then do the same with the other side, starting at the bottom again and making sure there are no twists it the strap. 10. Machine it in place, near to the edge of the ribbon to make it neat. Scruffy Cats in Pom Poms & Felt. We love pom poms here but they’ve not been out for a while. Long autumn nights and evenings watching Strictly are here though, which means some winding of pom poms can happen and some cute crafts too. I’m still busy experimenting with making realistic patterns from different wool winding techniques but here are our first two scruffy cats. One has wool pom pom ears and a tail made of strands of wool tied together (Maddy did that one) while Amelie made one with a flat felt tail and felt ears. On the left is Top Hat Cat. He’s made from two colours of yarn (Sirdar Hayfield Double Knit Acrylic which is easy to use and nice and cheap!) which are wound simultaneously to give a speckled look. Amelie glued an extra large and large medium pom pom together to make the body and added tail, eyes and nose with felt pieces. 1. Cut out a rectangle of felt to the desired size and overstitch the two short edges together. 2. Place the cylinder on some felt and draw round it to make a top circle. 3. Overstitch that on to one end. Turn it through. The result is suitably scruffy and banged up – perfect for an alley cat. 4. Place the cylinder on felt, draw around it once close to the edge and again with a wide margin (inner circle and brim). Cut out the bigger circle first, then cut out the smaller circle so you have a ‘doughnut’ shape. 5. From underneath, overstitch brim to hat. 6. Cut two slits for ears. Cut out some felt ear shapes in cat colour, poke them through the slits and glue the whole thing to the cats head, making sure you also attach the ears so they don’t float free! Maddy’s cat was inspired by an Aristocat and is wearing a beret. She made it with a circle of felt all glued and tucked under into the right shape, with a tiny matching pom pom made from yarn on top. He has pom pom ears (very cute) and a yarn tail. We’ve got more Cat Crafts on Pinterest and more Pom Pom crafts too.